As a patient with initially uncontrolled afib and afluttter, I know I have saved myself and the system time, money, and valuable resources by using my Kardia band in the past year. No unnecessary ER , fewer office visits, and a more relaxed patient as well. Wish all EPs used it. Just a study of comparison cost and time would be an eye opener ! Thanks for the feedback. I find it remarkable that none of my EP colleagues have embraced this personalized technology especially since they see patients of mine who have clearly benefited from it. Thanks to my series 3 Apple watch and Kardia band, with 2 afib episodes in the past 2 weeks, I was able to self medicate with 200 mg of flecainide to achieve NSR. I had very noticeable symptoms in both cases with ‘possible afib’ reported by Kardia. I saved myself 2 unnecessary, middle of the night, ER trips though I’ll probably have to stay on flecainide for some time now to stay in NSR. I had been off the antiarrhythmic prior to each episode. Thanks for that feedback on Kardia Band. Sounds like it is working very well for you. Hi Martha, For assistance with your KardiaBand, you can reach out to our support department at support@alivecor.com or 855-338-8800. Really appreciate all the medical and heart related information on your blog. I have the cardia band. and use it often to detect possible afib. Do I need to get alivecor mobile ecg with kardia pro as well? You should be able to utilize Kardia Pro with Kardia Band just as you do with the separate Kardia Mobile ECG device, they use the same app. For either you will need a physician that is willing to review your tracings and has registered with AliveCor through the Kardia Pro service. I meet my new EP tomorrow and I’m going to share this with him. Successful cardioversion followed by daily Flecainide has kept me in normal rhythm but I do slip in and out for brief moments (per my pacemaker readout). There are times when my heart is feeling jumpy and checking with my iPhone app shows difficulty pinning down my heart rate…I can see the squiggle in real time, but it’s just a heart rate monitor and really not suited to determine aFib. Thanks for this. Is there a KardiaBand for other watches or Fitbit devices?? I don’t use Apple products( personal choice). No. but perhaps any AliveCor people reading this could weigh in on future developments. 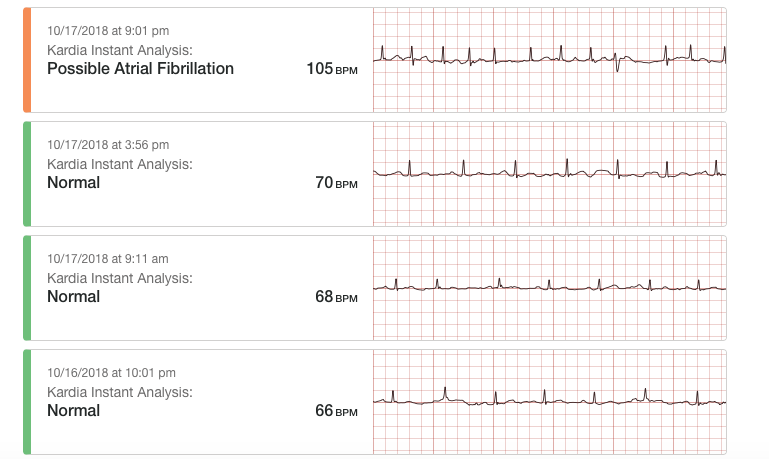 This has been about atrial fibrillation, but there’s a nasty kaleidoscope of wrong rhythms out there. Will the technology see atrial flutter? Will it count PVCs? PACs? It’s a (usually) high quality single ECG so all of these nasty rhythms can be recorded and diagnosed by a well-trained cardiologist. Computer diagnosis of these less common rhythms is often inaccurate, however, off 12 lead ECGs, so no matter “deep” the AI is in the app it may struggle with accurate interpretation. As far as PVCs and PACS, I am told that this capability is being actively investigated. Thanks! I had not seen this fantastic review article, apparently written by a cardiology fellow. I am a patient of Dr. P. I have been using the AliveCor for 4 years now every since Dr. P suggested it to me to know when I am in afib. I don’t usually feel when I go into afib. I have an Fitbit Ionic watch which reads my pulse rate at all times. I keep track of my pulse rate on it. When my pulse rate goes up and is erratic, I do an AliveCor reading and send it to Dr. P. He then knows when every I go into afib and when I go out of afib. I can’t say enough how this device has made my life easier and less stressed when I go into afib. If it displays Afib why can’t it be used to dx SVT, and more? The most common SVT, (AV nodal re-entry tachycardia) I would think the app algorithm could diagnoses with reasonable accuracy. However, again some SVTs are tricky even with 12 leads to diagnose and sometimes atrial flutter with 2:1 block mimics an SVT. The last thing Kardia wants is the app diagnosing SVT when it is really atrial flutter.